Numerous rheological and microvascular alterations characterize the vascular pathology in patients with type 2 diabetes mellitus (T2DM). This study investigated effects of vildagliptin in comparison to glimepiride on retinal microvascular blood flow and erythrocyte deformability in T2DM. Fourty-four patients with T2DM on metformin monotherapy were included in this randomized, exploratory study over 24 weeks. Patients were randomized to receive either vildagliptin (50 mg twice daily) or glimepiride individually titrated up to 4 mg in addition to ongoing metformin treatment. Retinal microvascular blood flow (RBF) and the arteriolar wall to lumen ratio (WLR) were assessed using a laser doppler scanner. In addition, the erythrocyte elongation index (EI) was measured at different shear stresses using laserdiffractoscopy. Both treatments improved glycaemic control (p < 0.05 vs. baseline; respectively). While only slight changes in RBF and the WLR could be observed during treatment with glimepiride, vildagliptin significantly increased retinal blood flow and decreased the arterial WLR (p < 0.05 vs. baseline respectively). The EI increased during both treatments over a wide range of applied shear stresses (p < 0.05 vs. baseline). An inverse correlation could be observed between improved glycaemic control (HbA1c) and EI (r = −0.524; p < 0.0001) but not with the changes in retinal microvascular measurements. Our results suggest that vildagliptin might exert beneficial effects on retinal microvascular blood flow beyond glucose control. In contrast, the improvement in erythrocyte deformability observed in both treatment groups, seems to be a correlate of improved glycaemic control. Type 2 diabetes mellitus (T2DM) is associated with numerous vascular and hemorheological abnormalities which merge together in an unproportional high risk for the development of micro- and macrovascular complications like retinopathy, nephropathy, neuropathy, or cardiovascular disease. The assessment of retinal microvascular architecture and the investigation of retinal arterial blood flow allows to detect early vascular abnormalities in patients with T2DM even before the clinical manifestation of diabetic retinopathy [1–3]. In recent studies, a close association could be found between retinal microvascular abnormalities and an increased risk for the development of nephropathy, neuropathy, myocardial infarction, or stroke [4–8]. Recently, dipeptidyl-peptidase IV (DPP-IV) inhibitors have been introduced in the treatment of T2DM. A couple of studies suggested pleiotropic effects beyond metabolic control for this class of drugs. Treatment with DPP-IV inhibitors was found to improve myocardial and endothelial function, to improve blood lipids, to lower blood pressure and to improve markers of renal function [9–16]. In vitro studies demonstrated that DPP-IV is expressed in endothelial cells, and the inhibition of DPP-IV reduced the microvascular tone through direct mediation of the nitric oxide system . Therefore, it seems conceivable that glucose-independent effects of DPP-IV inhibition might be mediated through GLP-1 receptor signalling and /or direct inhibition of the enzyme DPP-IV in vascular, renal, or retinal cells. Based on the different mode of action, these effects might not be applicable to other antidiabetic treatments like K-ATP-channel blocker such as sulfonylureas. The aim of this exploratory study was to investigate the effect of vildagliptin in comparison to glimepiride as add-on to metformin on retinal microvascular blood flow, retinal microvascular architecture and erythrocyte deformability in type 2 diabetic patients inadequately controlled on metformin monotherapy. This single-centre, randomized, open-label, parallel study compared microvascular and hemorheological effects of treatment with either vildagliptin or glimepiride in type 2 diabetic patients pre-treated with metformin. To be considered eligible, patients had to be aged 30–80 years with an HbA1c in the range of 6.5 to 9.5%. The main exclusion criteria were myocardial infarction or stroke within 6 months prior to study enrolment; impaired hepatic or renal function; moderate or proliferative diabetic retinopathy, more than one unexplained episode of severe hypoglycemia within 6 months; pre-treatment with other anti-diabetic drugs with the exception of metformin within the last 3 months and uncontrolled hypertension (systolic blood pressure >160 and/or diastolic blood pressure >90 mmHg). The study was performed in compliance with Good Clinical Practice and all applicable national laws and regulations. All patients provided written informed consent and the study was approved by an appropriate independent ethics committee. Eligible patients were randomized to vildagliptin or glimepiride in a 1:1 ratio. Patients received 50 mg vildagliptin twice daily. Glimepiride was administered in the morning with an individual dose titration in the range of 0.5 – 4 mg to achieve best possible glycaemic control as judged by the investigator. At baseline, after 12 and 24 weeks of treatment, patients entered the study site in the morning after an overnight fast of at least eight hours. Fasting blood samples were obtained for the measurement of blood glucose, HbA1c, adiponectin, and the determination of erythrocyte deformability. In addition, all patients underwent retinal fundoscopy and retinal microvascular assessments. Blood cell deformability was measured using a laser-assisted optical rotational cell analyzer by determining the elongation index (EI). Laserdiffractoscopy was performed using the Rheodyn SSD shear stress diffractometer (Myrenne GmbH, Roetgen, Germany). The method of laserdiffractoscopy has been described in detail previously . The applied shear stress was electronically regulated and consists of 8 increasing shear stress ranges (0.3; 0.6; 1.2; 3; 6; 12; 30; 60 Pa). The measurement detects scattered light intensities along orthogonal axes (A, B) of red blood cells within the laser diffraction light cone. The erythrocyte elongation index (EI) was calculated by the following equation: EI(%) = ((A − B)/(A + B)) * 100. To compare the EI over the applied shear stress range between both treatment groups, the area under the curve from 0.3 to 60 Pa (AUC0.3–60) was calculated using the trapezoidal method. Retinal capillary blood flow was assessed using scanning laser doppler flowmetry at 670 nm (Heidelberg Retina Flowmeter, Heidelberg Engineering, Germany). A retinal sample of 2.56 × 0.64 × 0.30 mm was scanned within 2 seconds at a resolution of 256 points × 64 lines × 128 lines. The confocal technique of the device ensured that only the capillary blood flow of the superficial retinal layer of 300 μm was measured. Measurements were performed in the juxtapapillary area of both eyes, 2 to 3 mm temporally to the optic nerve; the average from 3 singular measurements was taken. Analysis of perfusion images was performed offline with automatic full-field perfusion imaging analysis. This led to a perfusion map excluding vessels with a diameter of >30 μm, without lines with saccades, and without pixels with inadequate reflectivity. The mean retinal capillary blood flow was calculated in the area of interest and expressed as arbitrary units. Analysis of vessel diameters was performed offline with automatic full field perfusion imaging analysis (SLDF version 3.7) [19, 20]. Outer arteriole diameter (AD) was measured in reflection images, and lumen diameter (LD) was measured in perfusion images. The wall to lumen ratio (WLR) was calculated as (AD-LD)/LD. The laser scanning records were stored electronically and sent to a central reading centre (Interdisciplinary Centre for Ophthalmic Preventive Medicine and Imaging (IZPI) of the Friedrich-Alexander-University Erlangen-Nürnberg, Germany), for the measurement of retinal microvascular blood flow and the calculation of the retinal wall to lumen ratio (WLR). This reading centre was blinded for all other study procedures. Blood glucose levels were determined using an electrochemical biosensor (Hitado, Möhnesee, Germany). Plasma adiponectin was measured using ELISA (total human adiponectin, TECOmedical) and HbA1c was measured by HPLC (Menarini Diagnostics, Neuss, Germany). This study was designed as an exploratory study aimed to provide new data for thesis generation. No a priory confirmatory sample size estimation has been performed. All study endpoints have been analyzed with equal priority in a non-confirmatory, exploratory sense. RBF and WLR were assessed in a central reading centre in a blinded fashion. All other study endpoints were assessed in an open label approach. All study results were evaluated using primarily descriptive statistics. Inferential statistics was used to compare results from baseline to endpoint within both treatment groups. Differences in means of study endpoints were tested by Student’s t-test. In case of not equal variances in the data, the results of the Welch approximation was taken into account as result of the unpaired comparison. Results are presented as mean ± SD. Significance was set at a p-value less than 0.05. Data processing was performed with the software modules of SPSS (Statistical package for analysis in social sciences, release 19.0, SPSS Inc., Chicago, USA). Table 1 summarizes the demographics and baseline characteristics for the 44 patients included in the final analysis. Both study groups were comparable with regard to gender, age, HbA1c, and BMI. Patients in the vildagliptin group were found to have a slightly longer duration of T2DM compared to the patients in the glimepiride group. mean ± SD; $ = p < 0.05 in between both groups. As shown in Table 2, fasting blood glucose and HbA1c levels decreased continuously in both study groups from baseline to the end of the observational period. In patients treated with vildagliptin a reduction in body weight and an increase in adiponectin levels could be observed, while patients treated with glimepiride increased body weight with no change in adiponectin levels. BG =blood glucose; RBF =Retinal blood flow; WLR = arteriolar wall to lumen ratio; EI AUC0.3–60 = area under curve for the elongation index in the shear stress range of 0.3-60 Pa; mean ± SD; * = p < 0.05 vs. baseline. In both groups, an increase in retinal blood flow (RBF) and a decrease in the retinal arteriolar wall to lumen ratio (WLR) could be observed (Figures 1 and 2). After 24 weeks of treatment the increase in RBF and the decrease in the WLR reached statistical significance during treatment with vildagliptin, but not during treatment with glimepiride. No association was found between changes in glucose, HbA1c, or adiponectin levels with the parameters of RBF or arteriolar WLR. 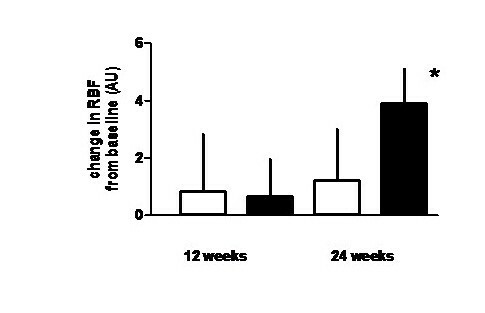 Mean change from baseline in retinal blood flow (RBF) during glimepiride and vildagliptin treatment after 12 and 24 weeks of treatment (□ = glimepiride; ■ = vildagliptin; mean ± SEM; * = p < 0.05 vs. baseline). 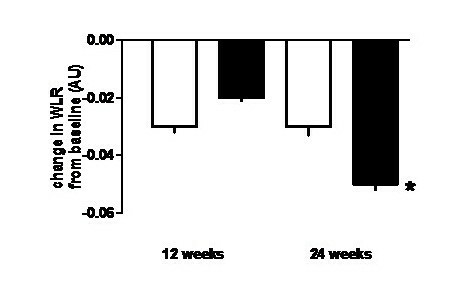 Mean change from baseline in retinal arteriolar wall to lumen ratio (WLR) during glimepiride and vildagliptin treatment after 12 and 24 weeks of treatment (□ = glimepiride; ■ = vildagliptin; mean ± SEM; * = p < 0.05 vs. baseline). In contrast to the findings in retinal blood flow, the erythrocyte elongation index (EI) improved significantly in both treatment groups over a wide range of applied shear stresses (Table 3). The area under the curve calculated for the shear stress range between 0.3 and 60 Pa increased from 2536 ± 228 to 2682 ± 240 AU*min (p < 0.0001) during treatment with glimepiride and from 2568 ± 196 to 2623 ± 210 AU*min (p < 0.0001) during treatment with vildagliptin. A linear inverse correlation could be observed between fasting blood glucose levels and the EI (r = −0.417; p < 0.0001), and between the HbA1c and the EI (r = −0.524; p < 0.0001). A slight positive correlation was found between adiponectin levels and the EI (r = 0.31; p < 0.001). mean ± SD; * = p < 0.05 vs. baseline. No severe hypoglycemic event was observed during the study. Symptomatic hypoglycemic episodes were reported in 29 cases during treatment with metformin and glimepiride and in 2 cases during treatment with metformin and vildagliptin. Both treatments were overall well-tolerated. No serious adverse event with causal relationship was reported during the study. Infections were recorded in 17.4% of patients during treatment with metformin and glimepiride and in 18.2% during treatment with metformin and vildagliptin. Gastrointestinal disorders were reported in 17.4% of patients during treatment with metformin and glimepiride and in 27.3% during treatment with metformin and vildagliptin. The burden of T2DM is driven by the development of micro- and macrovascular complications. Vascular dysfunction, changes in the vascular architecture, and hemorheological alterations are early features associated with obesity, metabolic syndrome and the development of T2DM. Remodeling of arterioles and small arteries is an early feature in retinal vascular pathology, and are often found even before the clinical diagnosis of diabetic retinopathy [1, 4, 21]. The retina offers the unique approach to visualize human microcirculation non-invasively and safely in vivo. Retinal vascular damage was shown to be predictive for the development of micro- and macrovascular complications [5, 6, 22–24]. A decreased retinal blood flow could be observed in T2DM in association with diabetic nephropathy , and an increase in the wall to lumen ratio of retinal arteries was found in association with increased blood pressure, and in patients with a history of cerebrovascular or cardiovascular events [7, 8, 26]. In a recent study, it was suggested that increased retinal arteriolar WLR may be a reflection of an altered endothelial-mediated release of nitric oxide . Recently, GLP-1 receptor agonists and DPP-IV inhibitors have been introduced in the treatment of T2DM. Treatment with the DPP-IV inhibitor vildagliptin was shown to be well tolerated, to reduce glucose excursions, and to improve the functional capacity of beta cell [28–30]. Apart from the metabolic effects, treatment with DPP-IV inhibitors is supposed to exert several pleiotropic activities which might modulate vascular function in T2DM [31, 32]. GLP-1 receptors are widely expressed in pancreatic, kidney, lung, brain, myocardial, and endothelial cells. There is increasing evidence that GLP-1 might improve endothelial and vascular function at least in part through nitric oxide dependent pathways [10, 15, 17, 33, 34]. In contrary, treatment with vildagliptin was found without beneficial effect on cardiac function in long term post-MI remodeling in rodents . In our study, treatment with vildagliptin in T2DM resulted in a significant improvement in RBF and a significant decrease in the retinal arteriolar WLR. These effects on retinal microcirculation became apparent in between 12 and 24 weeks of treatment with vildagliptin, indicating some time consuming structural changes in the microvascular system. It seems conceivable, that treatment with vildagliptin interferes with vascular remodeling of small arteries in patients with T2DM. In rodents, GLP-1 receptor activation has been associated with reductions in intima hyperplasia and PDGF-induced vascular smooth muscle cell proliferation [36, 37]. The clinical significance of the observed improvements in retinal microvascular blood flow and vascular architecture with regard to the development of diabetic retinopathy or other organ damage in T2DM remains unclear and needs to be clarified in pursuing studies. Nevertheless, our results are in accordance with numerous other investigations indicating an improvement in the vascular risk profile during treatment with GLP-1 receptor agonists or DPP-IV inhibitors [15, 38–41]. Despite comparable glycaemic control, these effects were much weaker during treatment with glimepiride, suggesting effects of vildagliptin on retinal microvascular blood flow which go beyond glucose control. Another important parameter in microvascular blood flow is blood viscosity, mainly driven by the elastic properties of red blood cells. The measurement of erythrocyte deformability reflects the ability of the cells to deform while entering small nutritive capillaries where the inner vessel lumen becomes less than the outer diameter of the blood cells, and the erythrocyte needs to assimilate while passing the nutritive capillary network [42, 43]. Impaired erythrocyte deformability in T2DM is reported in numerous studies using different technologies [44–47], leading to the suggestion that impaired erythrocyte deformability, at least partially, accounts for the impaired tissue nutrition observed in these patients. In a recent investigation, it was shown that patients with T2DM and coronary artery disease present with impaired erythrocyte elasticity compared to those patients with coronary artery disease without T2DM . An increase in blood glucose stimulates the glycosylation of the skeletal proteins beta-spectrin, ankyrin, and protein 4.2, while at the same time spectrin is damaged by oxidation . Erythrocytes in patients with T2DM further show a decrease of the Na+K+-ATPase and the Ca2+-ATPase activity [50, 51]. These alterations affect the membrane bilayer of erythrocytes in terms of their fluidity and might account for the increased rigidity of the cells. The role of elevated glucose levels on erythrocyte deformability has been described controversially [45, 48, 52]. The reasons for these discrepancies are matter of debate and might be explained by different patient populations or study designs. In our study, twenty-four weeks of treatment with glimepiride and vildagliptin improved erythrocyte deformability in patients with T2DM. An inverse correlation could be observed between erythrocyte deformability and fasting glucose levels (r = −0.417; p < 0.0001) as well as HbA1c (r = −0.524; p < 0.0001). Therefore, lowering of blood glucose levels in T2DM seems to improve the elastic properties of the erythrocytes independent from the kind of treatment. In accordance with a previous study, we found an inverse correlation between plasma adiponectin levels and erythrocyte deformability (r = 0.31; p < 0.001) . In hypertensive patients an inverse relationship could be observed between adiponectin levels and erythrocyte membrane fluidity as measured by an electron paramagnetic resonance and spin labeling method . In addition, this study demonstrated decreased membrane fluidity in association with reduced plasma nitric oxide metabolites. Because the deformability of erythrocytes is highly dependent on their membrane fluidity [54, 55], the reduction in membrane fluidity associated with low adiponectin levels might contribute to the alterations in blood rheology and tissue perfusion in patients with T2DM. In conclusion, our study suggests that treatment with vildagliptin exert beneficial effects on retinal microvascular blood flow and retinal microvascular architecture, which could not be explained merely by improved metabolic control. In contrast, the augmentation in erythrocyte elasticity seems to correlate with improved glycaemic control and are found independent from the kind of pharmacological intervention. Treatment with vildagliptin in patients with T2DM seem to provide beneficial effects on microvascular blood flow which could be explained by glucose dependent and independent mechanisms. Our study was designed as an exploratory study without a priory sample size calculation. All results have to be interpreted with equal magnitude in a non-confirmatory sense. Further pursuing studies have to confirm our results and to evaluate their clinical significance for the development of vascular complications in T2DM. Thomas Forst and Andreas Pfützner received research support and speaker fees from Novartis. Markus Dworak is an employee of Novartis. Christine Bernd- Zipfel, Georg Michelson, Michael Mitry, and Andrea Löffler have no competing interests. The study was supported by an unrestricted grant from Novartis. CB-Z was involved in study conduct and the preparation of the manuscript. GM was involved in protocol development, assessment of retinal investigations, and the preparation of the manuscript. MD was involved in protocol development and manuscript preparation. MM and AP were involved in study conduct and manuscript preparation. AL performed statistical analysis of the results. TF was involved in protocol development, study conduct, statistical analysis, and preparation of the manuscript. All authors read and approved the manuscript.